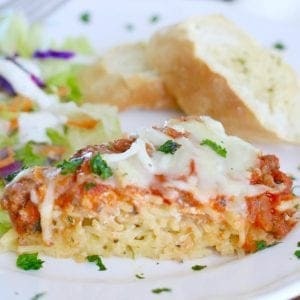 What’s better than spaghetti pie? 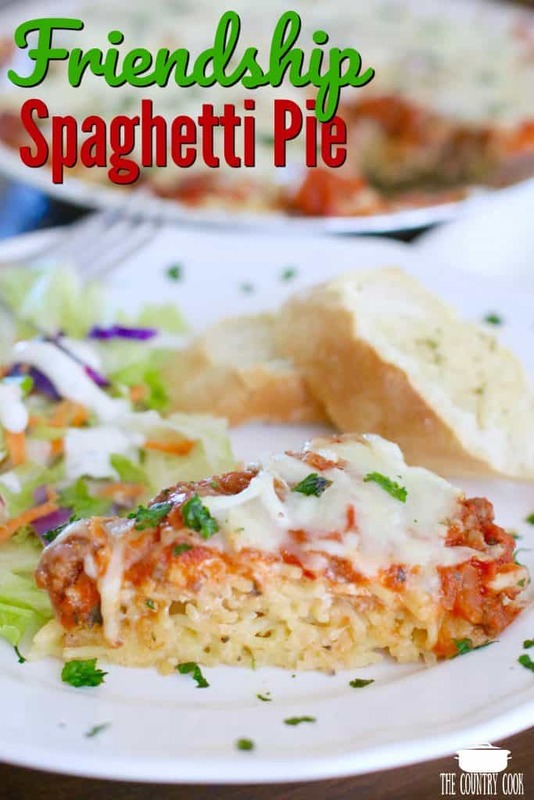 An extra spaghetti pie to share with a friend! 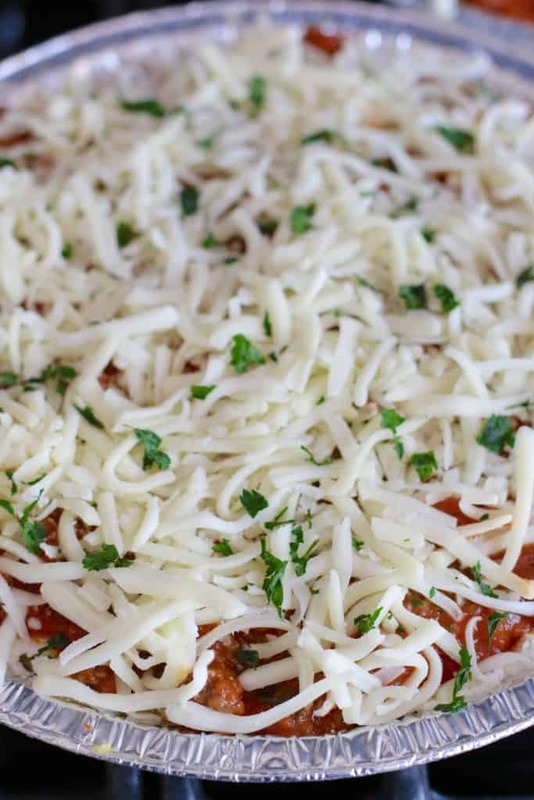 This recipe makes two (9-inch) spaghetti pies. 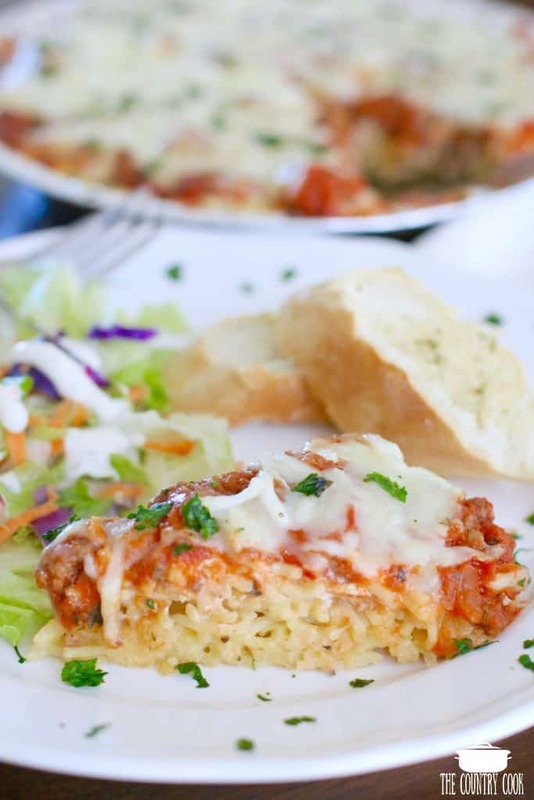 Each Friendship Spaghetti Pie is perfect for a family of 4. Depending on how much you eat, you can even stretch each one to serve 6 people. And it freezes beautifully! 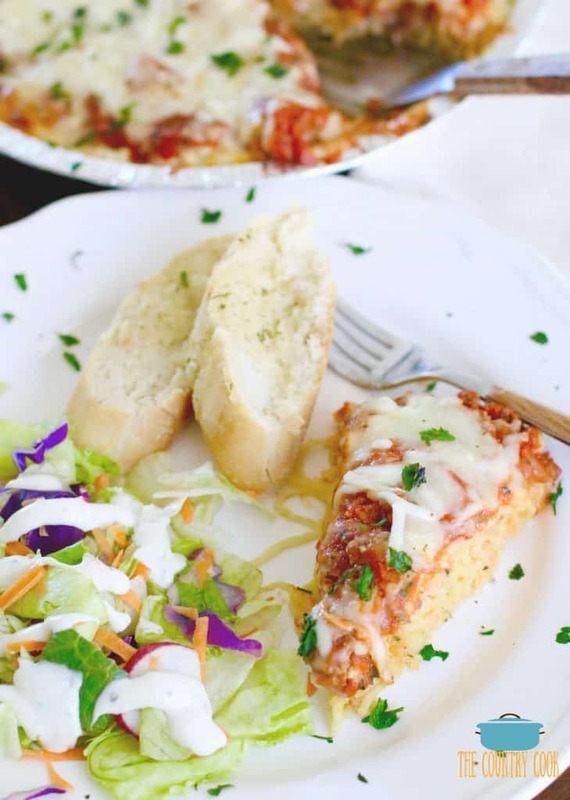 I have been working on this Spaghetti Pie recipe for a few weeks now. The first time I made it, I thought it was good but I knew it could be better. The seasonings really needed to be adjusted and it needed a little kick of flavor. Those test pies were still eaten but I wrote down some notes and made it again this week. One of the greatest gifts you can give someone is your time. In whatever form that may be. For me, it was making this meal to give to a dear friend who had more important things on her plate than dinner. 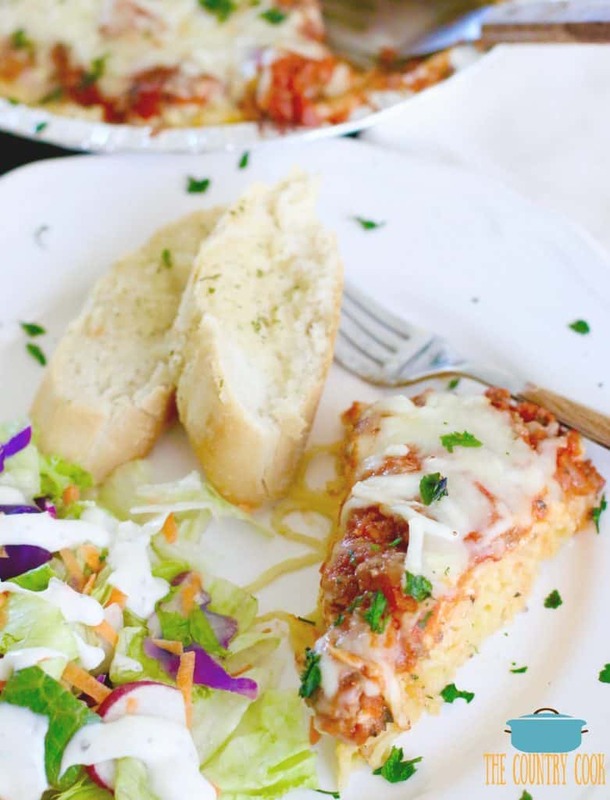 Make this spaghetti pie and give it to someone you care about. 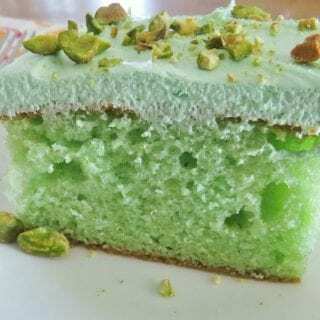 I promise, it will mean more than you know and heck, it tastes pretty dang awesome too! 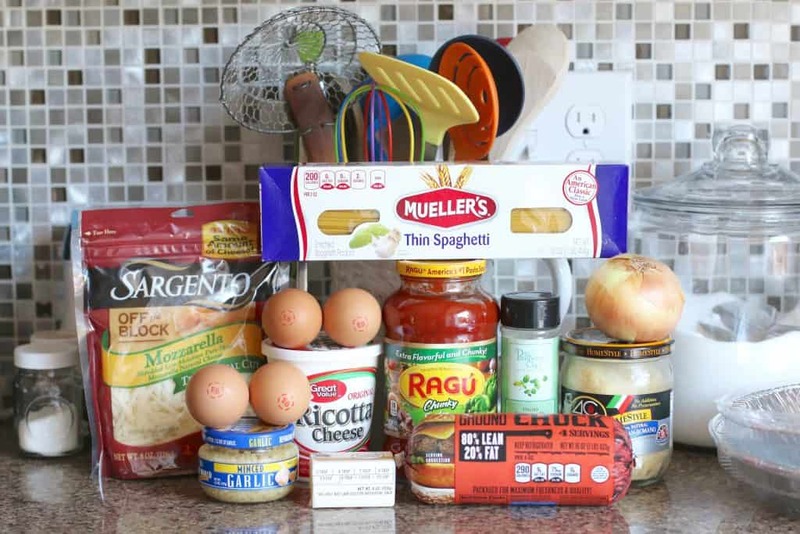 Cook spaghetti according to package directions. I make sure to season the boiling water with about a tablespoon of sea salt or kosher salt and olive oil before adding the spaghetti. 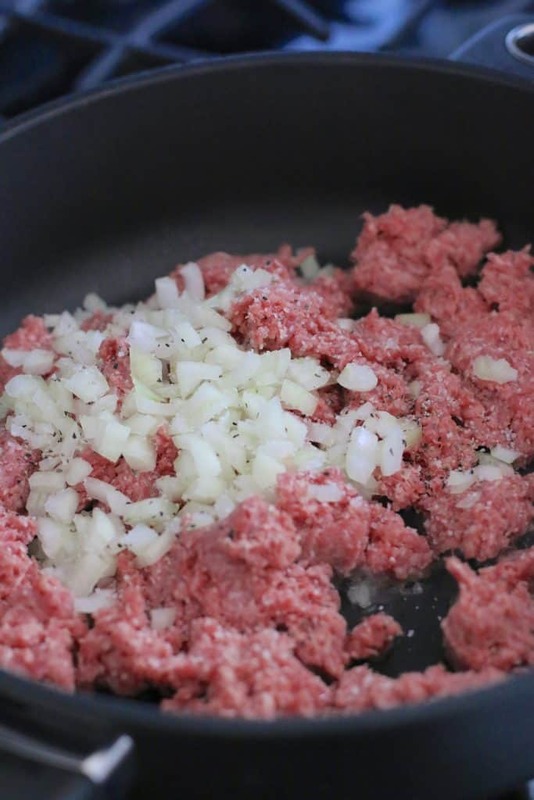 While spaghetti noodles are cooking, start cooking ground beef and onions. Once meat is browned and crumbled, turn off heat and drain excess grease. Put meat back into pan and then stir in spaghetti sauce. Leave it in the pan until ready to use. Once spaghetti has been cooked and drained. Turn off heat. Pour spaghetti noodles back into pot. 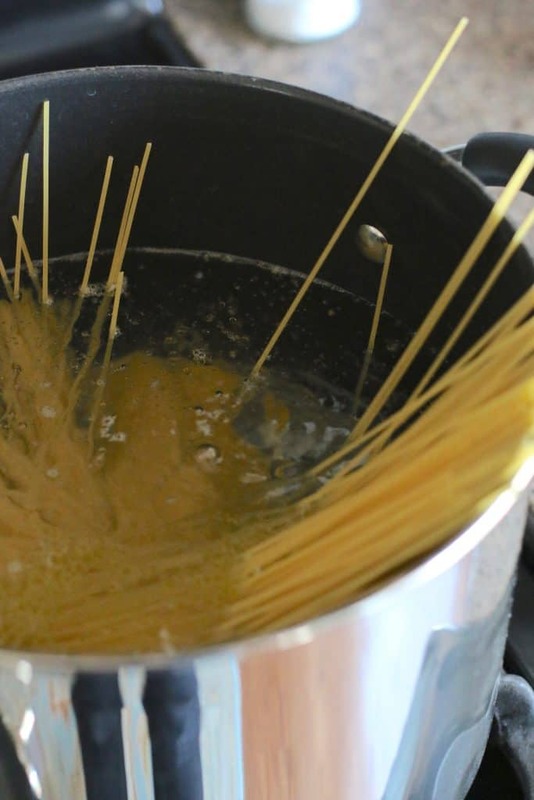 Stir in butter until it melts and coats the spaghetti well. Then stir in beaten eggs and parmesan cheese. Stir quickly. 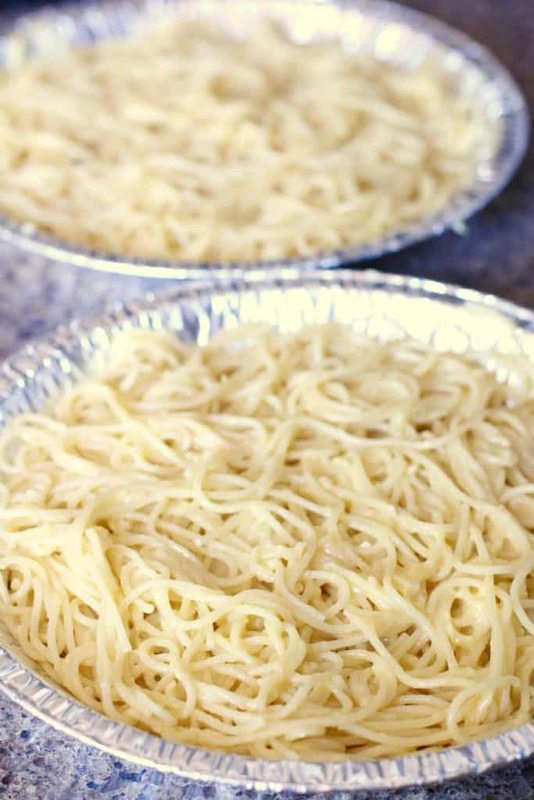 Set out two 9-inch (ungreased) pie pans and evenly divide spaghetti noodle mixture into each pan. 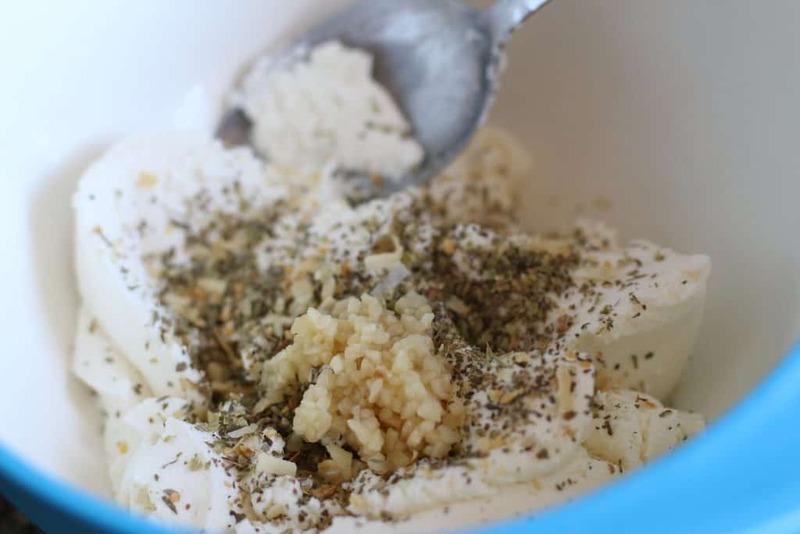 In a medium bowl, combine ricotta cheese with garlic and Italian seasoning. Stir well. 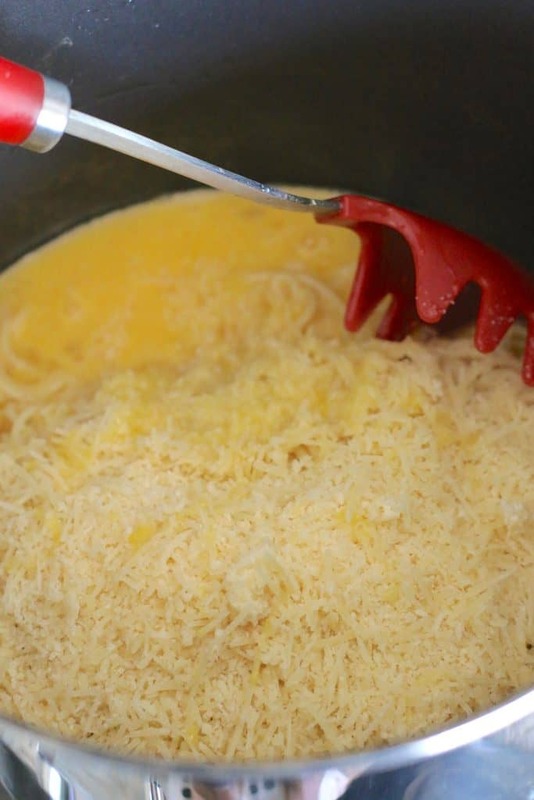 Evenly distribute cheese mixture over each pan of spaghetti noodles. Drop it all over by small spoonfuls. Then take the back of the spoon (or a butter knife) and spread it out evenly over the noodles. 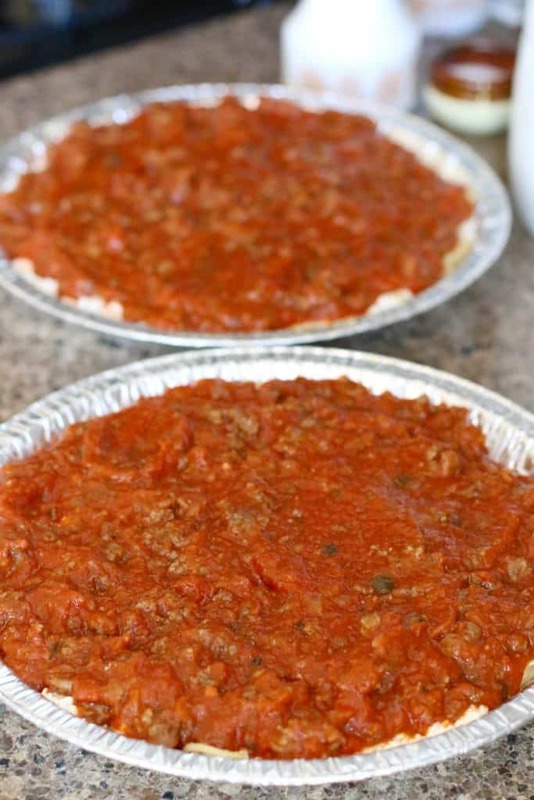 Top each pie with meat sauce. Evenly dividing it between both pans. 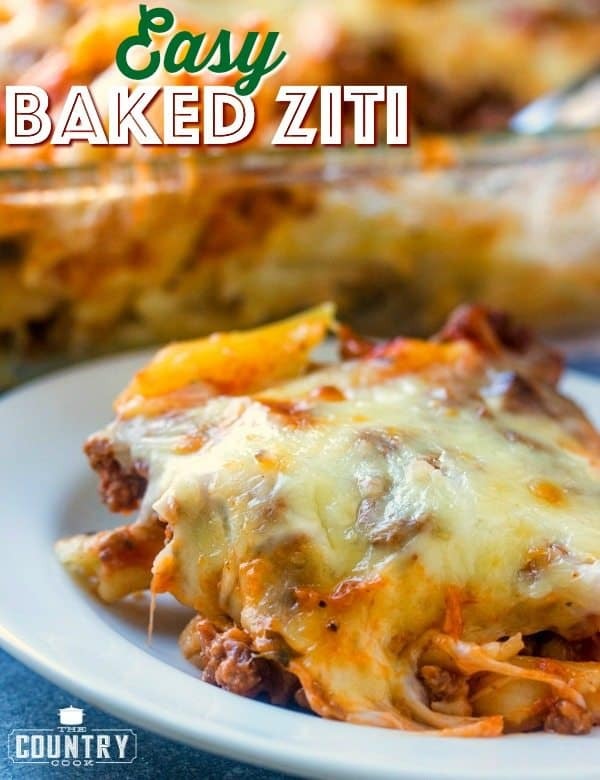 Finally, top each pie with shredded mozzarella. Again, dividing it evenly between each pan. And, to make it look pretty, you can sprinkle with dried parsley. Not necessary but I like to see a little green on top. Now, if freezing the pies, I would cover well with plastic wrap. Then I would wrap it with a layer of aluminum foil. Then freeze. I like to get the disposable pie tins that come with lids so I would then put the lid on it. That will make sure it’s well-protected from freezer burn. These particular pie tins came with a plastic lid and bottom so I had to make sure I told my friend to remove that plastic bottom piece before cooking. You don’t want any plastic melting in the oven. Since I was giving the second pie to a friend, who was making it for dinner that night, I didn’t worry about wrapping it in plastic wrap or aluminum foil because it wasn’t going to be frozen. 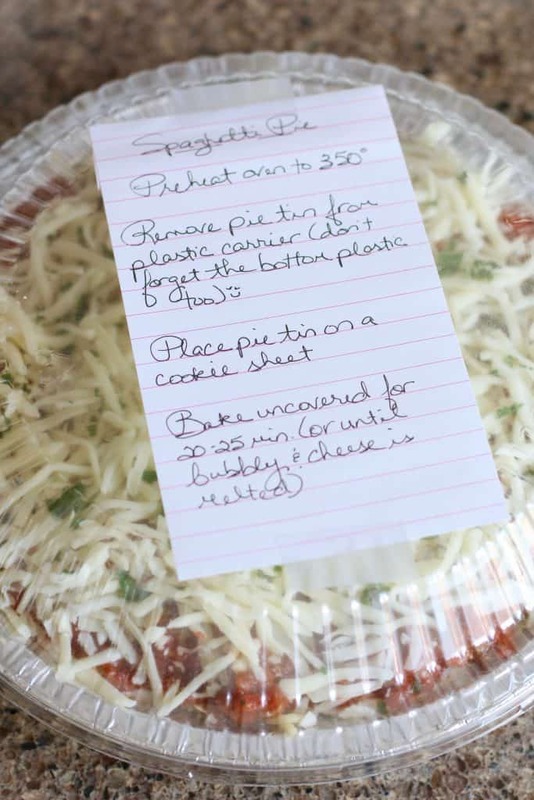 I just wrote some instructions on a piece of paper and taped it to the lid. I also included some frozen garlic bread to go with it. Usually I will include a bagged salad too. 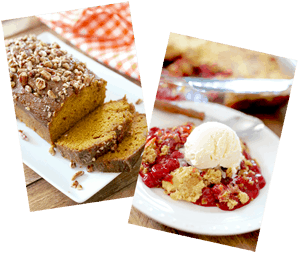 Now, if you are ready to bake your pie for dinner. Preheat your oven to 350F degrees. 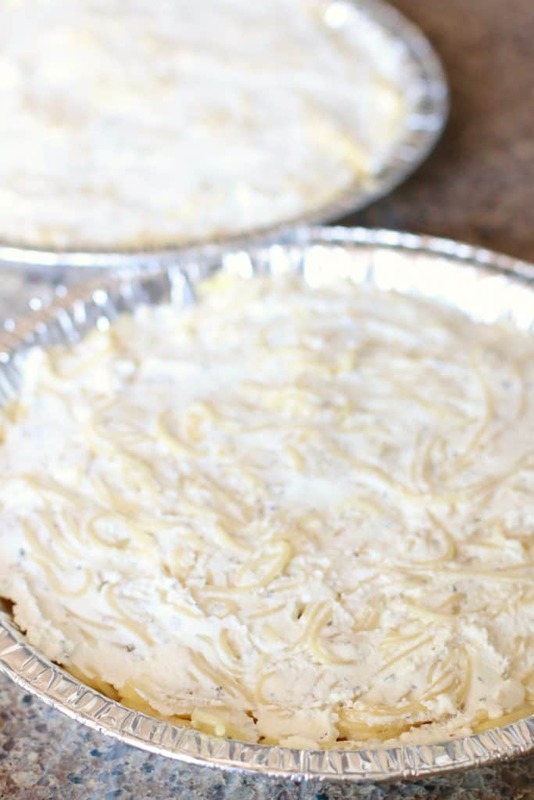 Place the pie tin on a cookie sheet (this will make it easier to put in and take out of the oven.) 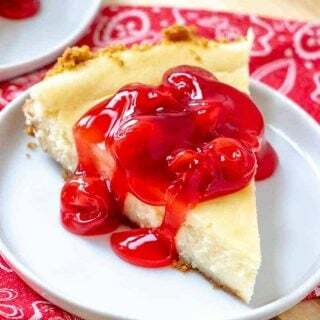 Bake pie for about 25 minutes until bubbly and cheese is melted. 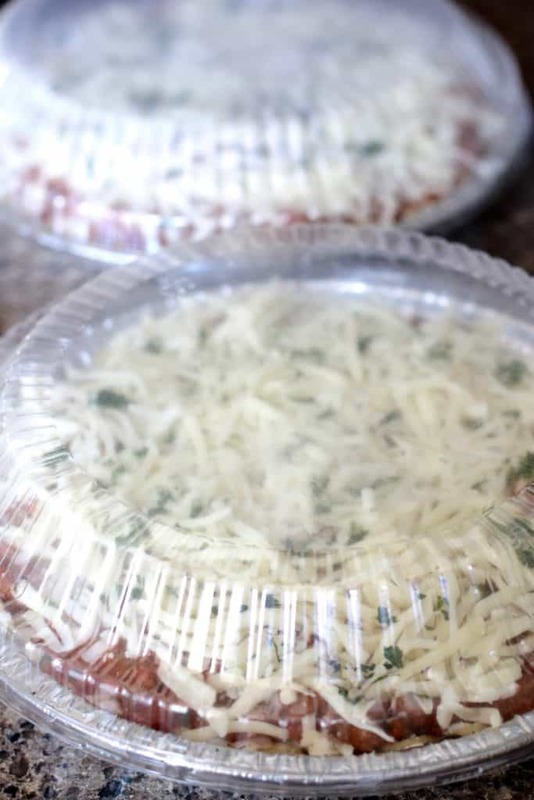 If cooking from frozen, remove all plastic wrap and aluminum foil and any lids, etc. Place pie tin on cookie sheet and bake uncovered for about 45 minutes until bubbly and cheese is melted. 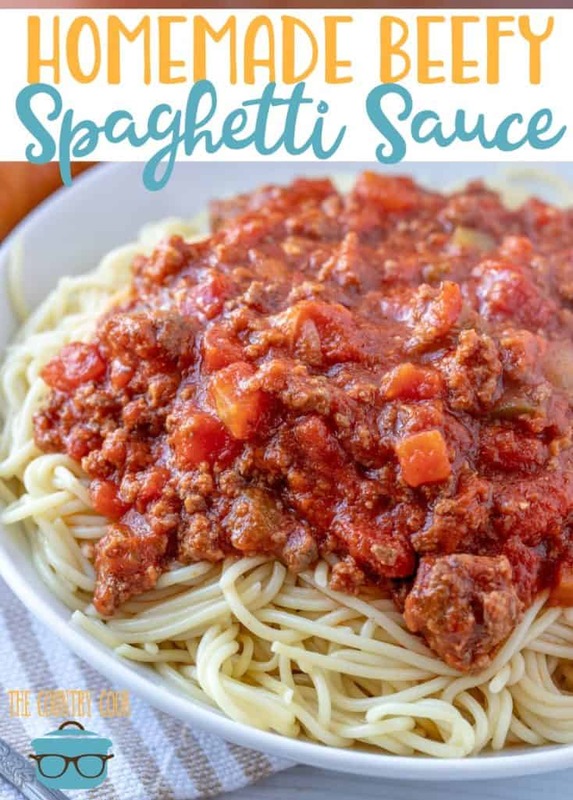 Make sure to season the boiling water with about a tablespoon of sea salt or kosher salt and olive oil before adding the spaghetti. 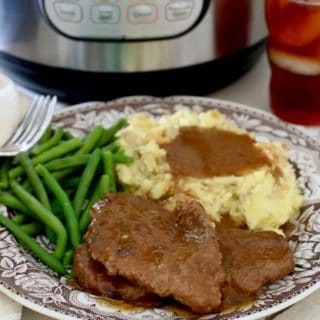 After meat is browned and crumbled, turn off heat and drain excess grease. 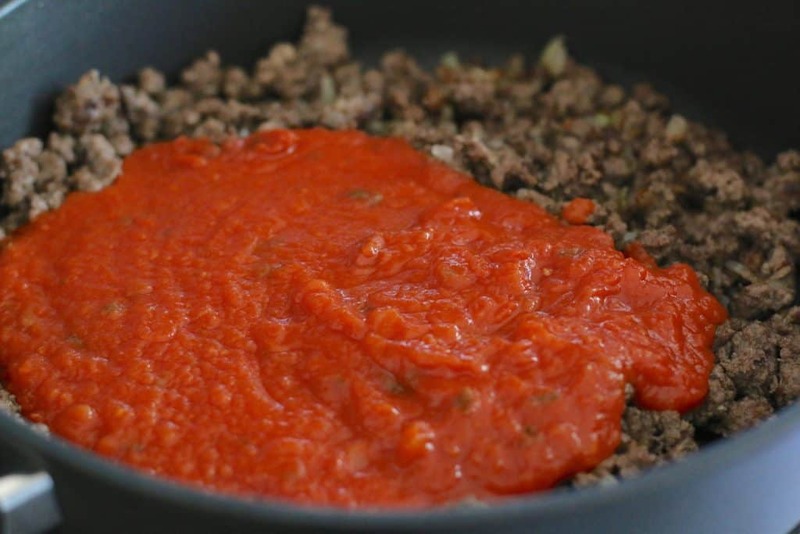 Put meat back into pan and then stir in spaghetti sauce. Leave it in the pan until ready to use. Once spaghetti has been cooked and drained. Pour spaghetti noodles back into pot. 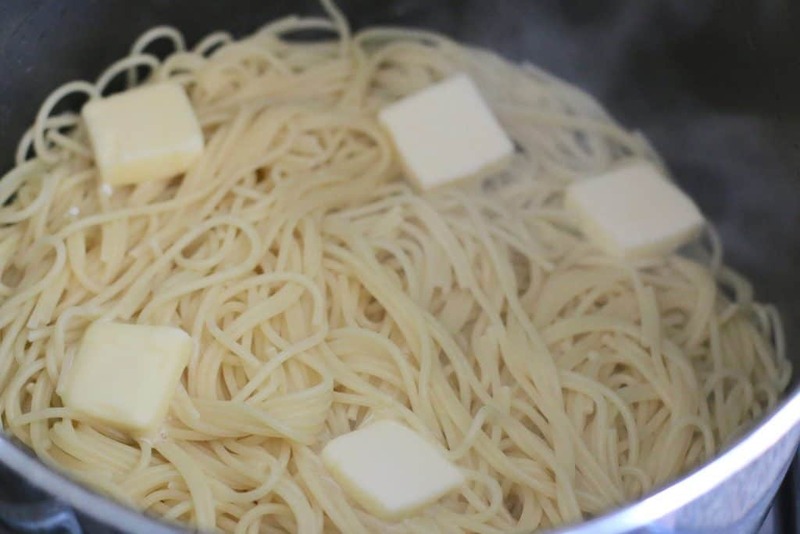 Stir in butter until it melts and coats the spaghetti well. 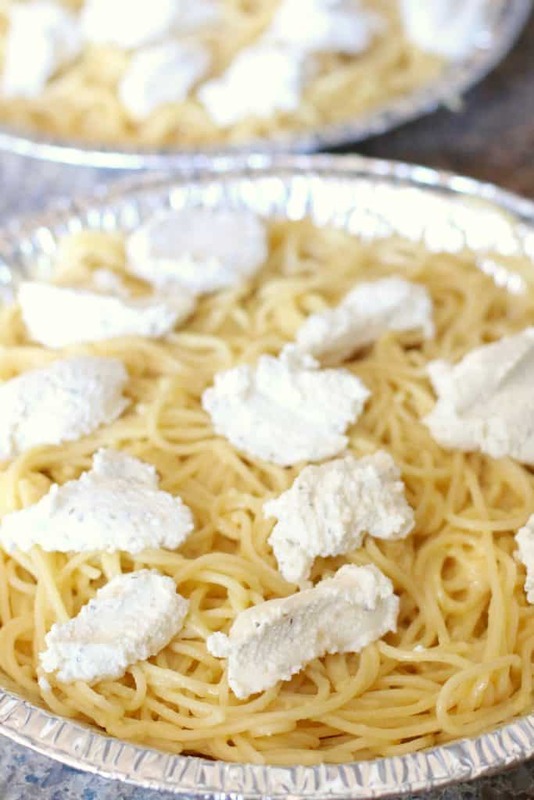 Then take the back of the spoon (or a butter knife) and spread ricotta out evenly over the noodles. DIRECTIONS FOR IMMEDIATE COOKING: Preheat oven to 350F degrees. Place the pie tin on a cookie sheet (this will make it easier to put in and take out of the oven.) 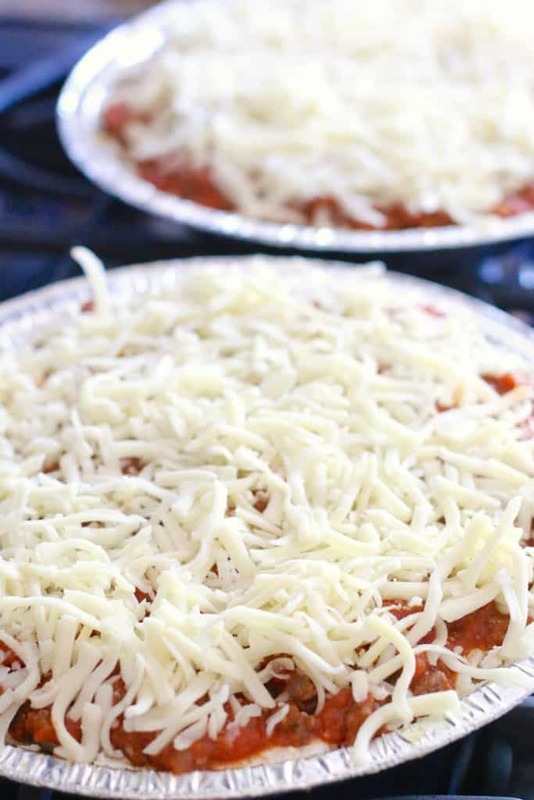 Bake pie for about 25 minutes until bubbly and cheese is melted. DIRECTIONS FOR FREEZING: Cover well with plastic wrap. Then wrap it with a layer of aluminum foil. 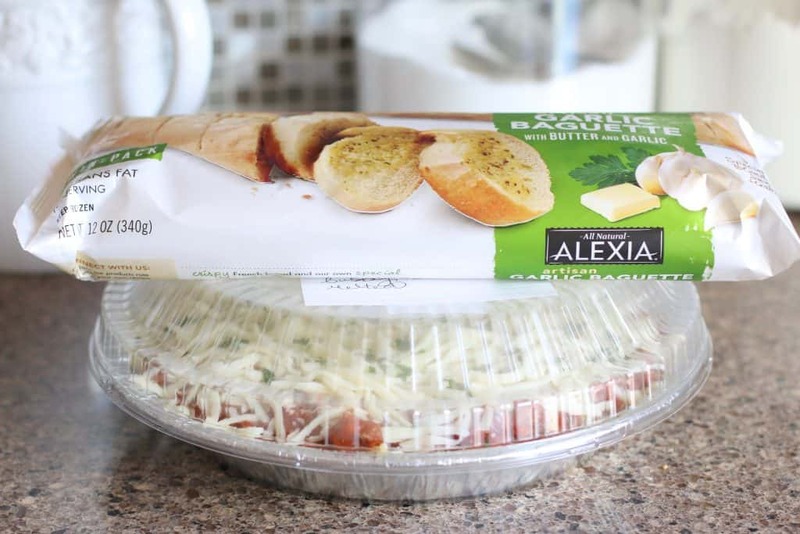 If your disposable pie tin came with a lid, put the lid on top as well. Then freeze. 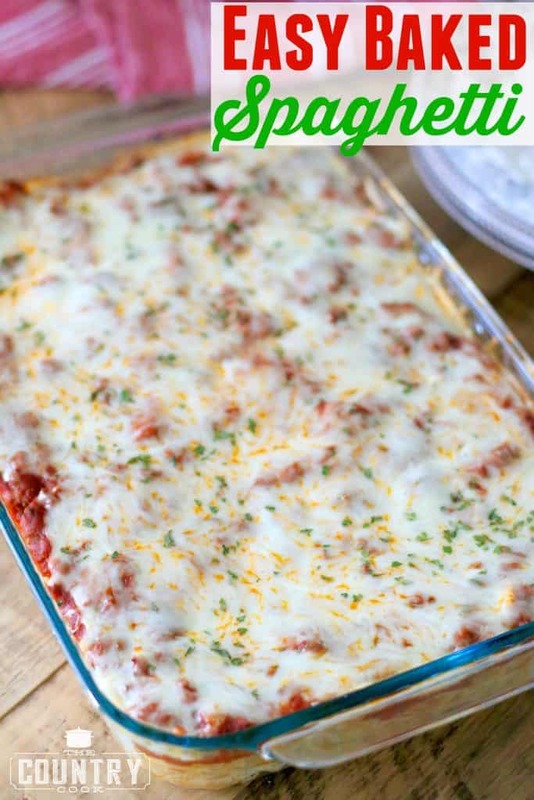 When cooking from frozen, remove all plastic wrap and aluminum foil and any lids, etc. Place pie tin on cookie sheet and bake uncovered for about 45 minutes until bubbly and cheese is melted. Updated to add: The original post had a giveaway that has now ended. I love eggs scrambled,fried,omlets,in sandwitches, and I just love them. They are so quick for a meal. 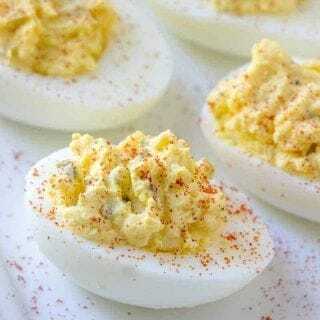 Not commenting on the eggs, but I made the recipe and everyone enjoyed it. 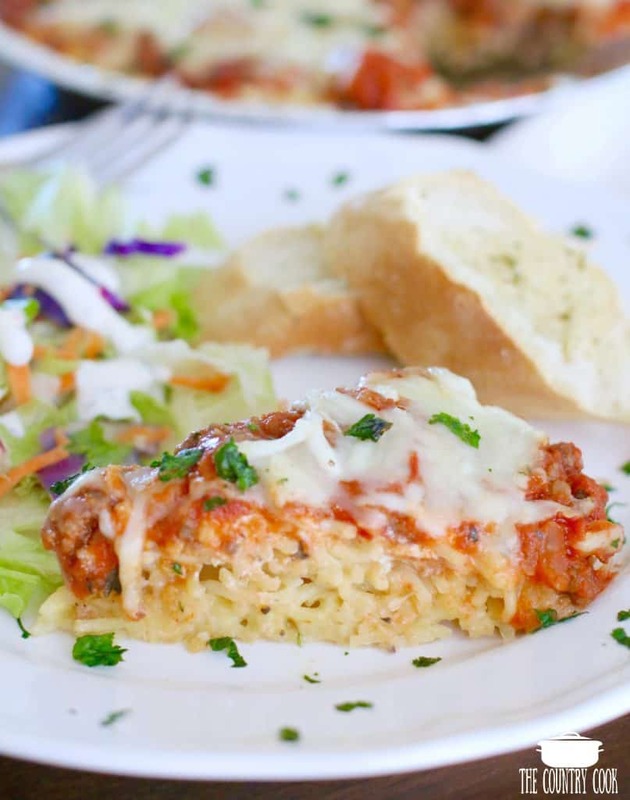 I understand it's suppose to be a layered type dish, but I have to say I think next time I will stir it up prior to cooking,or stir the sauce with the noodles just so you get a taste of the sauce in every bit. I found if you just had a noodle bite it was a bit bland. But overall a great recipe. I found your link on pinterest. 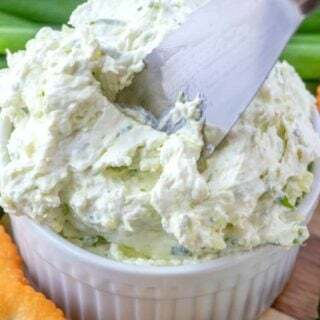 I chose your recipe since it used ricotta, I am a little scared to use cottage cheese, cream cheese and sour cream as the other recipes like this one suggested. 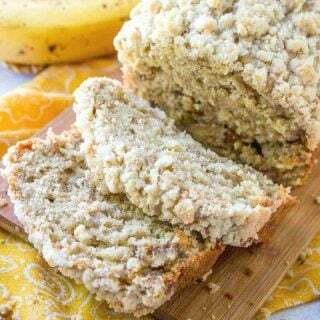 So thanks for a great recipe will definitely make again. I also cut the recipe in half to just make 1 pan, and we still have 1/2 of it left. Thanks again!